The barcodes will be launched for use by consumers in the United Kingdom, first. Nestlé has just announced that it is updating its packaging to provide a more mobile friendly experience through the use of QR codes that will provide consumers with nutrition and other relevant information. Scanning the barcode also reveals the social and environmental impacts of the company’s products. The first consumers who will have access to these new packages that feature QR codes will be those in the United Kingdom. They will be available on the multipacks of the Kit-Kat two finger chocolate bars in Ireland and England. Consumers will be able to read more about the ingredients that make up the product and how they can be enjoyed as a part of a balanced diet and more healthy lifestyle. 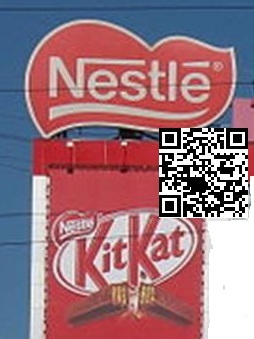 The QR codes also reveal how the chocolate bars were produced to bring them to their store shelves. The Nestlé product QR codes will direct consumers to mobile friendly websites which contain farm more information than could ever be printed onto the actual product labels on the packaging. The company intends to spread the use of these quick response barcodes across all of the products that it has to offer, and is only getting started with the U.K. and the Kit-Kat bars. A simple scan of the QR codes using a smartphone or tablet that has a free scanning app will allow consumers to obtain added information about how to live a healthier lifestyle in general, even with the occasional treat such as a Kit-Kat. It includes guidance about proper portion control, healthier recipes, and the role that all of this plays in a balanced overall diet and lifestyle.